Dhaka, 29 August, Abnews: NASA’s Juno spacecraft captures the striking atmospheric features of Jupiter’s northern hemisphere in this series of color-enhanced images. 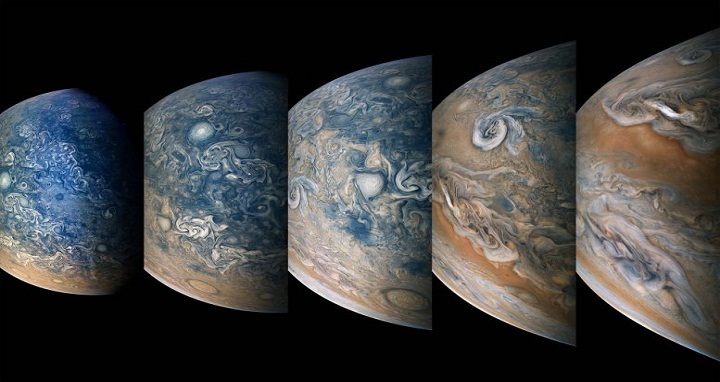 From left to right, this sequence of images was taken between 9:54 p.m. and 10:11 p.m. PDT on July 15 (12:54 a.m. and 1:11 a.m. EDT on July 16), as the spacecraft performed its 14th close flyby of Jupiter. At the time, Juno’s altitude ranged from about 15,700 to 3,900 miles (25,300 to 6,200 kilometers) from the planet’s cloud tops, above a latitude of approximately 69 to 36 degrees. JunoCam’s raw images are available for the public to peruse and process into image products at https://missionjuno.swri.edu/junocam. More information about Juno is at https://www.nasa.gov/juno and https://missionjuno.swri.edu.